Big, Big or Biggerer? New wheel options available now. | Bird MTB – Born in Swinley, Built in the UK. At Bird we’re fond of pushing something good when we believe in it fully. We’ve always been fans of big rims, and we’re happy to announce 3 new wheels for the line up, available going forward. 30mm M502 DT Options and 35mm Hope options now available. For those who’ve never tried it, widening your rims has some pretty awesome effects on tyre stability, which lets you run pressures you probably never thought you could. Lower tyre pressures in turn offer much greater traction and stability to the ride, as well as comfort. Its a win-win situation. Not only that, but lower pressures don’t slow you up, infact many studies have concluded that lower tyre pressures don’t increase rolling resistance by any notable degree. The ability to deform to the contours of the trail give huge increases in grip, without notable disadvantages. Recently there’s been a few ‘Plus’ bikes cropping up, well more than a few! We got in early with the plus testing, and gave it a punt, but it didn’t really work out for us… I’m not going to get into a dissection of Plus tyres though, thats a fad already fading, so we’ll move on. The tread can become too flat, increasing drag, and meaning the side lugs run out of grip too soon, or are too ‘edgy’. Sidewalls can be perilously exposed beyond the tread, making tears more likely. Squarer sides give better support, so reduce squirm and squish, particularly in corners, at low pressures. Wide Trail (WT) is the moniker Maxxis gave to tyres designed specifically for wider rims. They are NOT plus tyres. Hell, they aren’t even half-plus in many ways. Plus is a new direction that sets its own path, while WT evolves the existing with an updated way of thinking. When Maxxis launched Wide Trail tyres, they also stated ‘these tyres are optimised for 35mm internal rims’. As we’ll discuss later optimising is not the same as set in stone, but at least they made their stand, they called a rim width out and said ‘this is it’. Someone, somewhere, thought about the their best combination of the variables available and made a call. That is the big deal here. Plus on the other hand is not so well defined. Why does this matter? Well I guess it does for many reasons, but really it matters because theres a range of rim widths and bike designs for Wide Trail that works properly, and a range that doesn’t, and thats kind of it. For the first time someone is saying ‘This tyre, this rim.’ No messing, no pretending its the best new thing ever, just a statement of intent. Stick within the boundaries and you’re all good. Wide trail in essence is tyres deigned for 35mm rims. Bigger tyres, designed for 35mm rims. Thats it. No magic, no marketing BS. Just thoughtful design. OK, not the first time I’ve used that title in a Facebook Note, I apologise for the repetition. You should care though because Wide Trail, and the many variants of that which other manufacturers, not allowed to call their tyres ‘wide trail’, but serving the same purpose, IS the future. I’m quite lucky I guess. I get to try things much earlier than most people. I’ve had WT tyres since before most of the people reading this knew it was even a thing. And I like them. I like them a lot, because it serves a very obvious purpose, improving grip without too many compromises. Thats something I, and I guess you, can buy into. Boost, or not so much? One point worth noting, but not labouring is Boost, and what it offers, or rather doesn’t. You may notice that our new bikes, the Aeris 120 and 145 are both Boost-ed. Boost is basically, for those who don’t know or really care, a 6mm wider axle spacing than a normal bike as has been for ever. For the longest time the rear axle spacing on your bike was effectively a 142mm spacing (even if it was 135 QR – its the same in essence) but now its moved to 148mm, so 6mm more. Both sides of the bike at the back are 3mm wider, which gives more room for your tyres… Sort of. The sort of comes from the fact that 3mm either way is, well, not that much. Squeezing in all the stuff you need to race an FS bike meant that when you accounted for mud, and I mean proper, British mud, even a 2.3 was a pinch on most bikes, impossible (even in the dry) on some. Boost translates to 0.19 of an inch either side, so 0.38 Inches in total extra width. Supposing you had a 2.3 tyre in a non-boost frame, you could move to a 2.68 tyre in a boost frame easily enough. Well nearly… Boost however doesn’t account for lack of change in q-factor, essentially the width of the cranks at the tip, so even though you get a theoretical .38 inch gain, when you take into account the fact that you need to cut the chain-stays in to their original width at the crank tips for the unchanged q-factor, you’ll find boost doesn’t really offer you that gain. Its a little less. Let’s call it 0.3 inches for now. Boost gets you to about a 2.6 tyre in terms of modern bike design without significant messing about. Now you maybe start to see why 2.5/2.6 is probably the future? Sure we can mess about with oddball split chain-stays etc. to get a 2.8 or 3.0 tyre in there, but ask yourself (especially if you’ve ever owned a very tight clearance FS bike) ‘Why didn’t you do that for me before?’. There are good, and not so good reasons, but what you need to take away from this is that Boost doesn’t equal plus. Not even close. * Given widths are internal width. I should say at this point I am a wheel geek. Proper geeky. 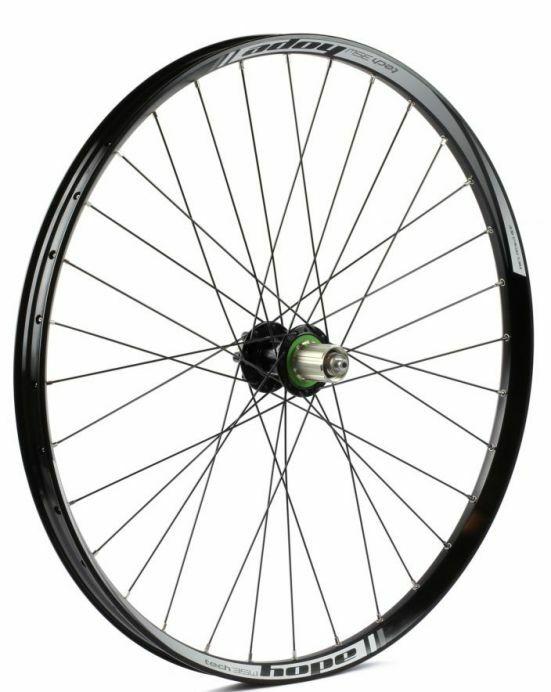 Nothing gets me excited like a new wheel to build. For me wheels are the my favourite bit of a bike to perfect after shock tunes. I leave the really tricky stuff to Dan, and simply lean over his shoulder occasionally and shout things like ‘It needs to be slacker’, or ‘Make it prettier’. My technical input is limited by my lack of technical FEA/CAD/Super-techie-engineering-knowledge at best in such matters, but when it comes to wheels, thats a whole, big, other story. We’re launching** wheels in 30 and 35mm widths, and that’s where it’s important to understand what that means for you, the bike buyer. Specifically what’s the difference? Well 30mm will run current and WT tyres, while 35mm won’t really. Its not to say your wheels won’t go round, or you won’t enjoy it, but I think the cut off for non-WT tyres is around 32mm internal width. Bigger than this and the drawbacks begin to outweigh the benefits on non-WT tyres. They get too square, and the sidewalls too exposed. It’s a word of caution I guess. If you’re going wide, 30mm is as wide as you can go and still have all the tyre choices available to you. At 35mm you are committing to WT as far as I can see. Thats not necessarily an issue of course, as long as you don’t mind the cost. While we’re starting to bring in WT tyres direct from the Maxxis factory, reducing the cost to you the buyer, its still a significant premium option at the moment. WT style tyres are appearing at a significant rate – you wont be short of options, but you might find a 30mm rim offers more options right now at a better price than 35mm. ** Technically we launched the DT 350/M502 wheels months ago, but hey. Can I run WT on 30mm? L>R Minion 2.5 WT on 35mm rim, Minion 2.3 on 30mm rim, Minion WT 2.5 on 30mm rim. Note the block size, significant width and height differences. You will no doubt see the WT tyre sizes up very similarly on a 30 and 35 rim. I’m personally running WT tyres on a 32mm rim right now, and I’m happy with the results. Perhaps its compromised over a 35mm rim, but its still good! Well, WT tyres are taller, thats an important point, its not the be all and end all, but it sneaks the 27.5 tyre size towards its ultimate pinnacle of being genuinely half way between 26 and 29 inch tyres. It improves the roll over a little and offers even lower viable pressures. I hope thats been a worthwhile 10 minutes of your time, any questions mail us at info@birdmtb.co.uk!